Youth Discipleship; What if young people were performers of the gospel? In some places we might be lucky to have any 12 year olds in church. Let alone give them a platform. At the same time many 11-12 year old are captains for sports teams, leaders in uniformed groups, participants in school councils. What I found growing up evangelical, was exactly this, or well not quite this but something similar. What I did was make the translation from reading the Bible, the works of Jesus, and the commands to ‘do good’ , to ‘doing activities in the church’ , and trying (but often failing to be ‘nice’). Though I was given lots of responsibilities in a local church, all very positive, inclusive and participatory, this didnt seem to equate with the kinds of things that seemed important when I read the gospels. Jesus didnt say – now children go and work the OHP, or hand out hymn books. But it seemed to be the spaces the church created for me to act. In session I suggested that we have often viewed church as the source of learning for discipleship. It is implicit in a way, and cultural, given that for many of the last 200 years churches have also been ‘sunday schools’, and before that, church was the only place to go to ‘hear’ the Bible being read, before the printing press. Learning has become a key feature and implicit in the building and practices of the church. It is therefore not unusual to see the process of discipleship as a learning experience. From Sunday School upwards, or was it from Sermons downwards, this process can often be heavy on the cognitive learning, low on the connection to real life, and even lower on the value of actually doing something. The forming of disciples can feel like a learned experience in closed off boxes, and the actions that follow usually are to help children and young people be the ‘Christian children all must be, Mild, obedient, good as He.’ That gets sung at this time of the year. And ‘learning first’ discipleship is almost the only model in current youth discipleship. A quick survey of ‘ready to use material’ often points to ‘themes’, ‘games’ , ‘messages to reveal’ and questions for young people to reflect on. None of which in any way is invalid. What happens when this ‘method’ fails, is to ramp up the anti, and make the games bigger, more stupid and dangerous. What the type of teaching implies is that listening and the moral behaviour that is encouraged by it, is what discipleship is all about. The problem with learning first discipleship – is that it feels a world away from the type of space created in the ‘open’ session. And not just for young people. Often to help people learn more about faith we ask them to ‘come to another event’ or to ‘do a course’ – for young people it is often the same. Open club to youth alpha equivalent. But many youth fellowships are not too dissimilar. Meant to be about discipleship – often not much more than an hour of games and a two minute epilogue. However, it is still learning first, even in a 2 minute epliogue. It would be easy to say that a consequence of some of these kinds of learning discipleship has produced effects such as MTD (moral therapeutic Deism (search this site for more on this) or that a ‘Happy Midi Narrative’ exists in which faith is just so that young people feel happy/confident. Once in this type of rut has set in it is time for a cure. But there is no cure needed for the young people who are just connecting to your church via open sessions, youth clubs or messy church – this is an opportunity to do differently from before. What i suggested in the talk, and then also in my Thesis, is that we need a new metaphor for thinking about young people (in fact all) in the church especially in discipleship. It is that of helping young people be ongoing performers and be formed through performances. A crisis of discipleship needs new imagination. What if we perpetuated the idea that the Gospel was a drama to be performed – rather than to be learned and understood? What if young people learned how to ‘do’ the gospel, before learning it? What then, might action first – ‘learn’ second discipleship look like? On one hand it looks like Jesus. Though the disciples watch him go to the village and meet the samaritan woman ( John 4), when he commands them to go to the villages two by two, these are not places he has been before, and with minimal instructions and equipment, commands them to go. And they come back and talk about their experiences. Though he has ‘done’ something in their presence and they watched – he is not ‘with’ them as they go and do it later on. When Zaccheus ‘does’ something in the repaying of tax receipts, it is there where redemption is found and Jesus finds a home. How might both of these be ‘played’ out in the ongoing ‘acting’ of the gospel as a drama with young people? Put it this way, if a young person sells their xbox and gives the money to the foodbank, is this a salvific act? The Christian Drama, calls us to action; ‘faith requires self-involvement; we too are asked to become part of the drama’ (Richard Carter, Sam Wells, 2014). Drama means Action. One of the fascinating stories that I heard in Newcastle at the seminar, was of a young person who was part of a youth club in which they did alot of social action/justice type projects within the group, they did fundraisers for charities, wrote letters to MPs, and got involved with campaigning. For anyone thinking of doing this in youth groups then theres usually a stack of free resources at Tear Fund/Christian Aid or others. However, what the youth leader found is that when the young people ‘did’ more social action and supporting/protesting – so their faith also grew. Young people would voluntarily read more of their bibles, and pray in response to the actions they were taking. They were building a movement of faith and justice, and their discipleship framed around it. Its a profound thing to think that young people might be reading the Bible as their guidebook for creating social transformation! 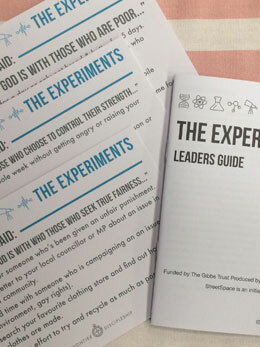 In the grip of anxiety about numbers and success, it is easy to fall into the safe game, or to do the ‘tried and tested’ – even if the tried and tested is by established youth ministers or in a recognised publication- what we need is a new imagination for the process of discipleship – that views young people as participators of the drama, and ourselves as co actors with them. One that imagines and experiments, and appeals to meaningful actions that young people can do (together) on the stage of the world. So, what about ‘action first’ discipleship? It might require new imagination, it might require us to think about how ourselves an young people are caught up in a larger drama that we are all part, and have roles to play together. Beyond the open interaction of the youth club – if they wont ‘sit and learn’ why not create the spaces for them to have meaningful action, allow them to rise to the challenge. Maybe ‘action first’ is not that much different to ‘experiential learning’ – if thats an easier concept. The challenge too, is that neither young people, nor we, nor the church are the principle actors in the drama. So whilst we might give young people ‘prompts’ to their actions, we also need to help them be aware of and obedience to, (as Vanhoozer suggests), the voice of God in the midst of the action. Some things might need improvising even in the midst of them. Helping young people be active in discipleship is more than ‘just’ giving them something to do in our local churches, though, it possibly might help. Imagining discipleship as a drama, might help young people feel connected and participating in something, and also the agency to contribute meaningfully within. Christian children all must be, wild, creative, prophetic and challenging the structures, just like he? What if this was socially and for the common good – not just ‘morally’ good.? Shepherd, Nick, Faith Generation 2016, Nick discusses both MTD and ‘Happy Midi Narrative’ , more on MTD is here: https://wp.me/p2Az40-KS , or via the category tab. For more on Theodrama, see also the Theodrama Category on this site. ‘Albermarleys were dead to begin with…’ A Youthwork Christmas carol.